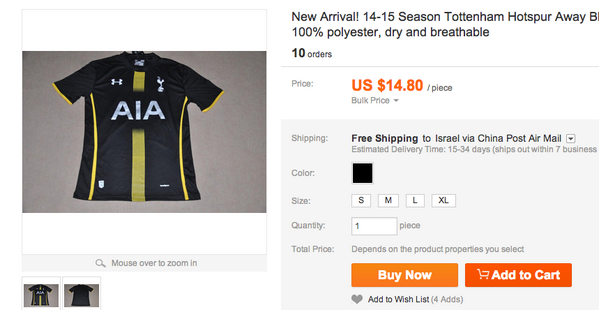 Picture of new Spurs shirt leaked online.A screenshot of Tottenham Hotspur’s new away shirt being sold has been leaked online this morning. The north London club look to have switched to a mostly black strip as their away kit for the 2014/15 season, with a streak of yellow down the middle and on the sides. Spurs mostly wore light or dark blue away from home last season, but have had similar away shirts to this one in the recent past, which should make it a popular choice as it goes up on sale this summer. SEE ALSO: The best goalkeepers according to FIFA 14.